You’ll live and breathe restrictions while you’re expecting. You can’t have sushi, and you can’t do any strenuous activities. Also, NO alcohol and caffeine is a serious no-no. The list goes on and on. But just because you have to give up certain things for nine months, doesn’t mean you have to give everything up. 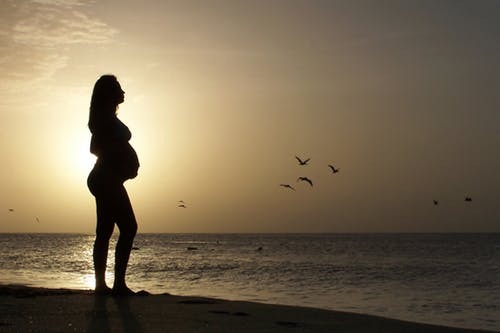 In fact, you should try to live a life as normal as possible and as far as possible while pregnant. But what about flying while pregnant? There are a ton of mixed emotions about travelling during pregnancy. While some moms say travel is fine during all stages of pregnancy, others restrict it to certain trimesters or are totally opposed to it. essentially, if you plan on travelling, it’s a conversation you need to have with your doctor or midwife. In general, flying while pregnant is fine, and as long as you feel comfortable to do so, you can and should. Life doesn’t stop when you’re pregnant. You’ll still have to attend weddings, birthdays and other important events. That being said, let’s just take a look at what to consider before setting foot on a plane with a bump on board. When is flying while pregnant safe? It’s always best to plan any trips that require flying while pregnant during the second trimester of your pregnancy. Again, always consult your doctor or midwife before making any solid plans. In general, the second trimester is when you’ll experience heaps of energy and when morning sickness subsides. It’s also a great time to travel since you’ll do it before the fatigue and constant trips to the loo of the third-trimester kicks in. Keep in mind that some doctors and airlines don’t allow women past the 28-week mark to fly, so if you want to go that route, be sure to get it cleared by your OB first. If you’re flying while pregnant, you should ALWAYS opt to sit in an aisle seat. Why? Well because it provides you with easy access to the bathroom! You can also get up and move around to keep you comfortable during the flight. If your budget allows it, upgrade your seats to business class where you’ll have some more space for your legs and your bump! One of the things you might want to consider investing in is a refundable ticket. Pregnancies don’t come with any hard and fast rules, so they’re super unpredictable. The last thing you want is to lose a considerable amount of money because you were suddenly unable to fly. Another thing to keep in mind is that you’re allowed to opt in for a pat-down at security if you don’t want to walk through the metal detectors. This can also help you avoid long queues, which is always a bonus!